When people think of Thailand they think of elephants and an encounter with the gentle giants is high on many a travel agenda. Since logging was banned in Thailand in 1989 many working elephants have been put to work to serve tourists often in poor conditions with poor treatment. We were very fortunate therefore to spend time with these incredible creatures in a way that did not compromise their wellbeing. Boon Lott’s Elephant Sanctuary (BLES) was founded by my incredible friend Katherine Connor who has made saving elephants her life’s work. BLES is located in rural Sukhothai, surrounded by plantations and forest – it’s a far cry from the restaurant in Essex where we worked together 17 years ago! 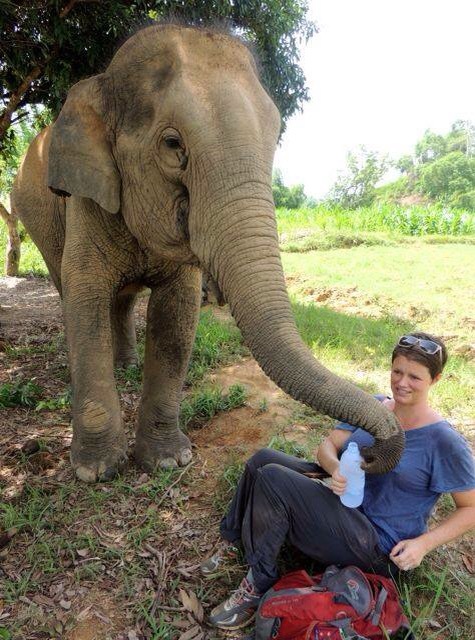 Katherine keeps visitor numbers low at BLES so as to not disturb the elephants. There are just 3 guesthouses on site and these are booked up at least a year ahead. We weren’t able to plan that far in advance, instead Katherine allowed us to come as day visitors and we lodged at a wonderful homestay a few miles away. We cycled to BLES through the countryside each morning; sawadee kaa/kap-ing merrily to the villagers. When we arrived for our first full day at BLES we were quickly introduced to The Gossip Girls; Wassana, Lotus and Pang Dow. Two of them have serious disabilities from their logging days and they have all had very difficult lives. These magnificent female elephants now spend their days trumpeting and squeaking to each other as they browse in the forest. They were feeling thirsty and took long drinks from the hose right next to us. Katherine explained that we wouldn’t be able to be this close with all of the elephants as some of them are not comfortable around people. 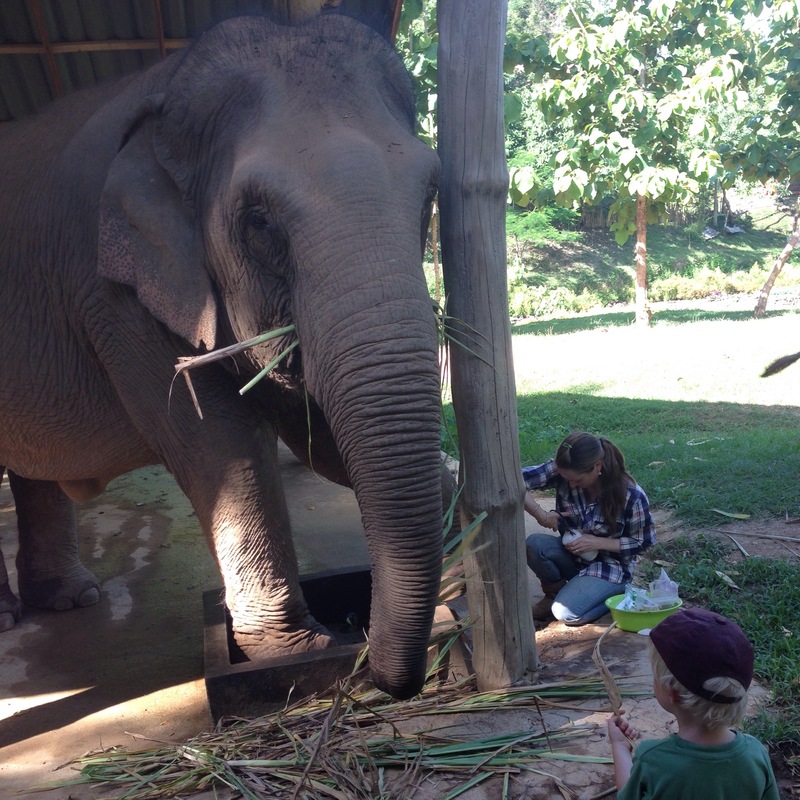 After a wonderful breakfast with fellow visitors we watched Katherine and the Mahouts attend to their injuries. 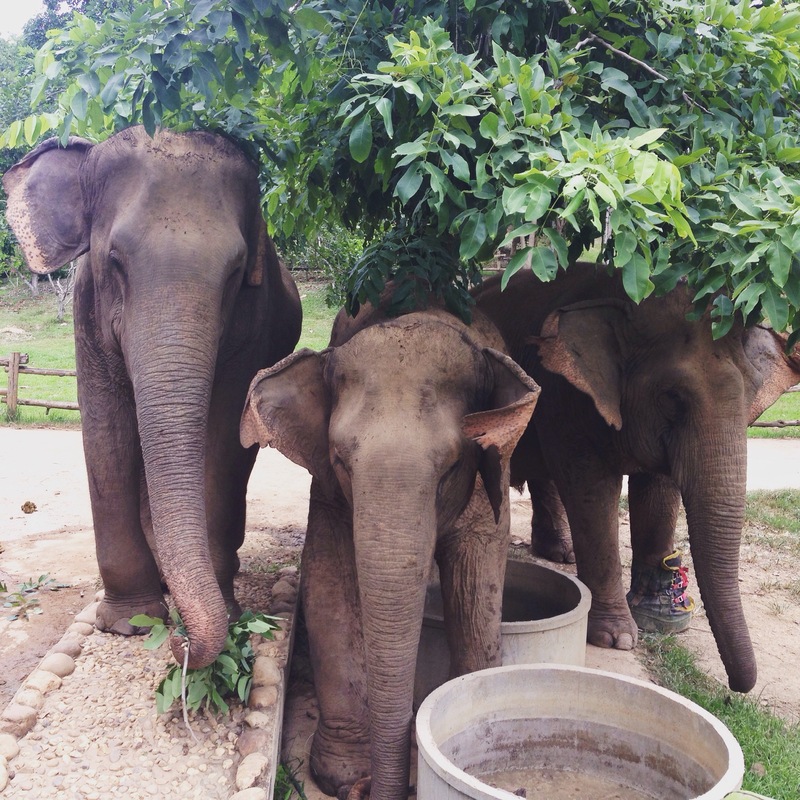 Wassana and Pang Dow have problems with their feet which need daily treatment. The boys were fascinated at the puss that shot out of Lotus’s leg as Katherine drained an abscess. Pang Dow walks on her ankle having never recovered from a serious break sustained from forced breeding. Wassana’s foot is badly damaged from standing on a land mine and she now has a specially made boot to protect it from infection whilst she is out in the forest. 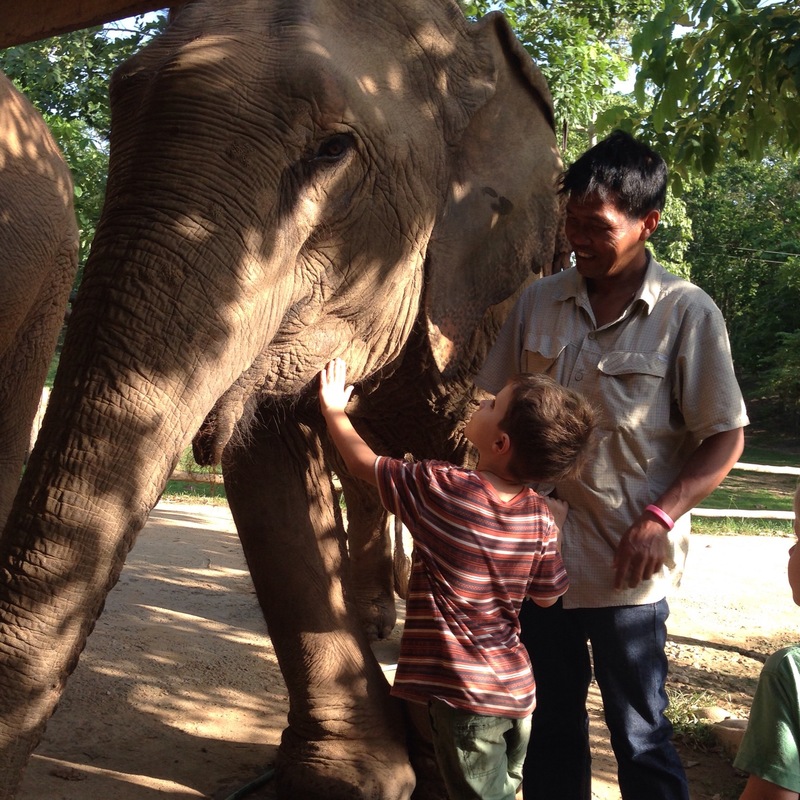 The boys stroked trunks and busied themselves collecting grass for the elephants until they were ready for their morning walk into the forest. We follow behind at a safe distance, waiting as they pause to graze along the way. At one point we needed to stand aside to let Mee Chok pass. A cheeky young bull, with unpredictable behaviour who spent his early life chained up in a filthy shack. We caught up with the Gossip Girls and spent a couple of happy hours in their company and with another group. It was fascinating to watch their social interactions and get interpretation from Katherine about why one elephant may have beef with another. We walked back for lunch and enjoyed watching elephants frolicking in the pond while we ate. We witnessed a tussle between Lotus and Mee Chok. Katherine explained that she is the only elephant that stands up to his naughtiness. We also watched as Wassana had her boot removed and proceeded to pull her bandages off with her trunk. 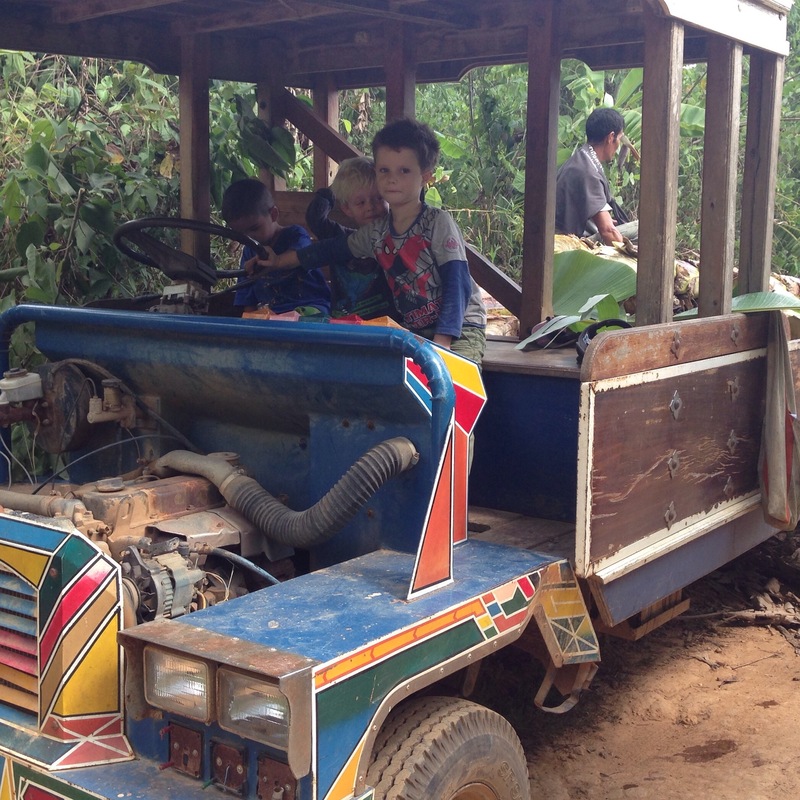 In the afternoon we piled into the sanctuary’s ‘limousine’ to collect additional food for the elephants from a nearby plantation. The ride on the old tractor was windy and bumpy but it still managed to lull the boys to sleep. The mahouts cut down banana trees and we carried them to the truck. It was heavy grubby work and we were soon drenched in sweat. Then we headed back to BLES sitting atop the banana trees. Katherine’s capacity for caring seems boundless, she just can’t see an animal in distress with helping. Because of this the sanctuary is not only home to elephants but also also dogs, cats, cows, wild boar and tortoises. The pond in the tortoise enclosure needed cleaning and the boys were keen to help but quickly lost interest leaving Nick and I to finish the job. After dinner and a tropical downpour we cycled back to the homestay tired and happy. To cap a perfect day we saw our first wild scorpion on the track outside the homestay, George was delighted. The next day was Saturday and the boys were very happy that Katherine’s older kids weren’t at school. They were soon busy with a pile of lego. We repeated the routine of the previous morning walking into the forest with the Gossip Girls after their clinic treatment. Nick wasn’t feeling very well so he stayed at base for a snooze. In the forest I had great interaction with Lom who took my water bottle and drank from it. I sat at her feet feeling very small with Katherine offering reassurance from nearby. The boys climbed a tree and collected stones. Katherine told us more about their complex social lives. Meanwhile back at base Nick had a visit from Tong Jai, an old and intimidating tusker. An encounter with Tong Jai is sure to make the hairs on the back of your neck stand up. 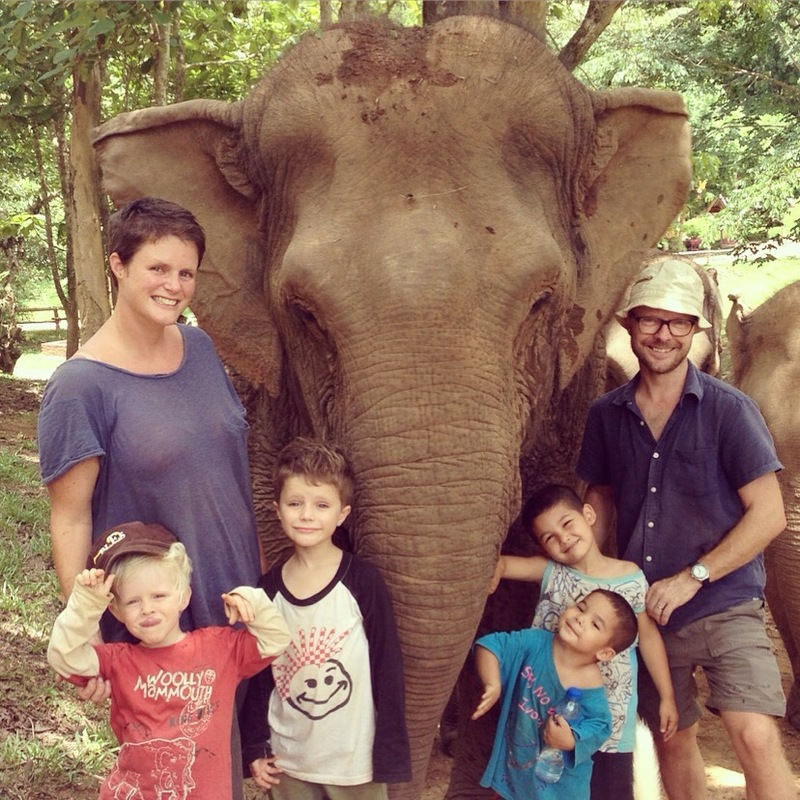 Only Anon, Katherine’s husband, is able to handle him and she told him how he once single handedly scared off poachers who were after Tong Jai’s impressive tusks. Katherine had recently organised some clinics for sterilising local cats and dogs and that afternoon we went to a nearby temple to check on some of the animals. When we got back the plan had been to wash some of the dogs but the water was off so we chilled instead. The boys enjoyed the company of Hope, Noah and Aaron. They played animal rescue together and got really muddy. When home time rolled around they were both really upset to say goodbye to their new friends. Whilst the children played I read all the elephants stories and I was moved to tears. I felt very guilty about having ridden elephants in India and Nepal. At the time the animals appeared well cared for and we enjoyed the experiences. But I didn’t know then about the brutal process of training an elephant, or that despite a long history of carrying heavy loads, elephants do not have strong backs. Later I asked Katherine about photos I’d seen of the mahouts riding the elephants as I knew they didn’t do this anymore. She adeptly quoted Maya Angelou: “Do the best you can. Then when you know better, do better.” It was a well-timed reminder for me to not beat myself up about the past and to act differently in the future. We certainly won’t be riding an elephant again. Katherine has built BLES from nothing and works tirelessly for the continued running of the sanctuary, caring for the animals, planning further rescues and the mammoth task of fundraising, not to mention being mother to five children. To say she is an inspiration is putting it mildly. It is rare to meet someone living their values with such conviction and the space she has created is testament to her love and passion. BLES survives on donations if you are able to help please click here. Wow! What an incredible experience! Great photos too!